Al Eby is a professional photographer and the owner of Blue Wing Gallery in Woodland. Growing up, Al’s love of photography was inspired by his father. As an adult, photography became a natural way for him to reflect on his adventures and share them with other people. Al specializes in portraits, and special event photography. He also offers photo retouching and restoration services to professional photographers, as well as the general public. Additionally, Al works as an independent graphic designer when time allows. He has over 30 years of experience in photography and graphic design. Even though he wears many hats, he puts his heart and soul into whatever project he’s working on. Al spends every free moment learning as much as he can about current trends in photography, and believes he is never too old to learn new skills. 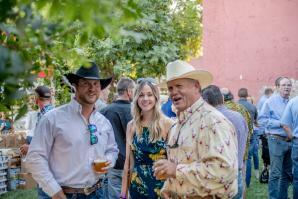 The 3rd annual Woodland’s Dinner on Main was held on Sept. 16 in historic downtown Woodland.